Put on a kilt, dress in tartan, try some haggis, or drink some smooth scotch. April is Scottish-American Heritage Month! Every April millions of Americans show off their Scottish roots with pride. Throughout the country, various national and local events are organized that celebrate Scottish culture. This is also a time to remember the contributions of Scottish-American politicians, leaders, inventors, etc. They’ve had a big impact on U.S. history — as you will see. Up to 10 percent of the American population is of Scottish-Irish descent — predominantly in New England, Appalachia and the Deep South. The inventor of the telephone, Alexander Graham Bell was Scottish. Many Scottish immigrants played an important part in history in this rebellion — refusing to pay the tax collectors during the revolt. The first Scottish-Irish merchants landed in Philadelphia — and were the first immigrants to settle in the U.S.
We mean dress up like a Scot! Get a kilt or wear tartan patterns. Or just red and black will do. Be proud of your heritage. You don’t have to have Scottish blood to enjoy Scottish food. Let this month be all about discovering Scottish delicacies — haggis, neeps and tatties, buttery shortbread, and wash it all down with some good old Scotch. Let history take you back to the days of the Scottish-American ancestors. Their stories, struggles, and achievements are legendary. Believe it or not, the beloved American icon was based on a businessman named Samuel Wilson — whose parents came to America from Greenock, Scotland. If you think fried chicken originated in America, you’re wrong. Scottish settlers introduced this dish to the Southern Colonies and the rest is history. Do the Scottish do well in politics? In America they sure do! Lots our presidents are of Scottish or Scottish-Irish ancestry. One of his fans discovered that Elvis’ ancestors lived in Lonmay, Aberdeenshire in the 1700s. Evidence shows they originated in there in 1000 BC. 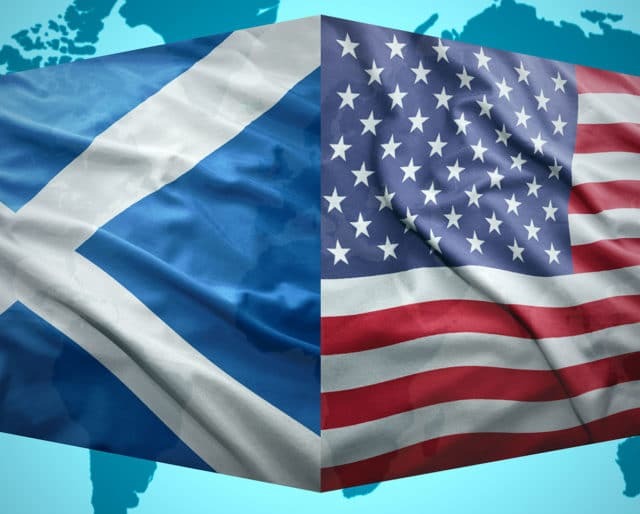 There are many Scottish Americans in the U.S.
About 25 million Americans claim to be of Scottish descent. And for each one of them, this month is special. Many people of Scottish descent helped make this nation great through their efforts and achievements. America is a melting pot of many cultures but occasions like these help us discover our traditions. They reminds us that each one of us is an important piece of the cultural mosaic.